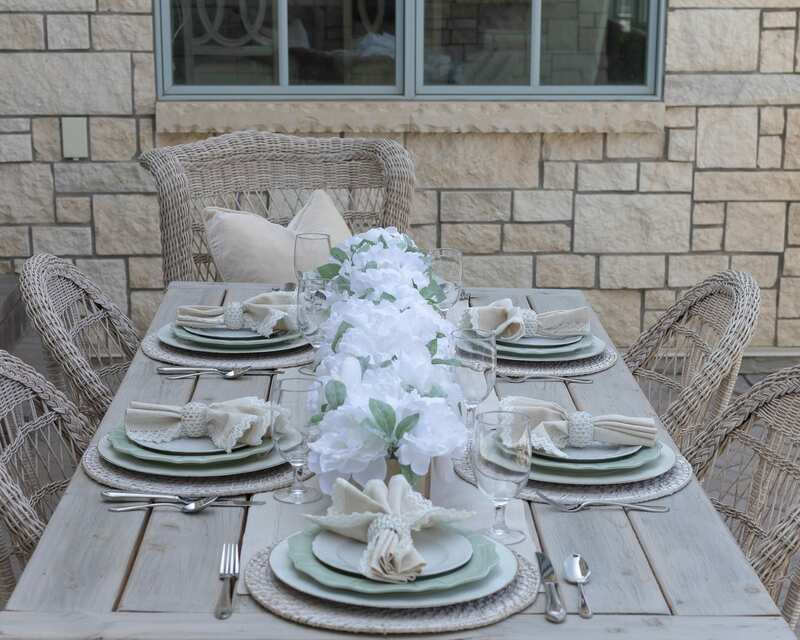 I pulled out my sage green dishes, white dishes, all my tan and white napkins, and wicker napkin rings. I also pulled out some woven placemats that mixed nicely with both sets of dishes and linens. I played around with the different plates and linens to see what looked nice together. 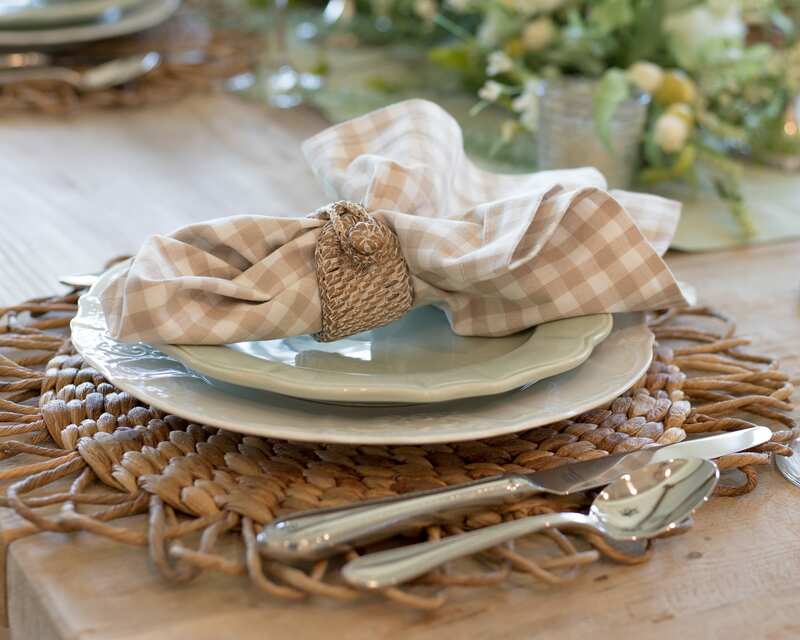 I knew I didn’t have enough of each of the dinner and salad plates to do twenty place-settings so I decided to use the white dinner plates and sage green salad plates for the inside table with the white and tan checked gingham napkins and reverse it for the outside table. Mixing up the two sets of dishes allowed me to use the same dishes and colors and still be able to create enough place settings for a large crowd. When I entertain adults and kids, I tend to take a more casual approach and this idea helped keep things simple for me. 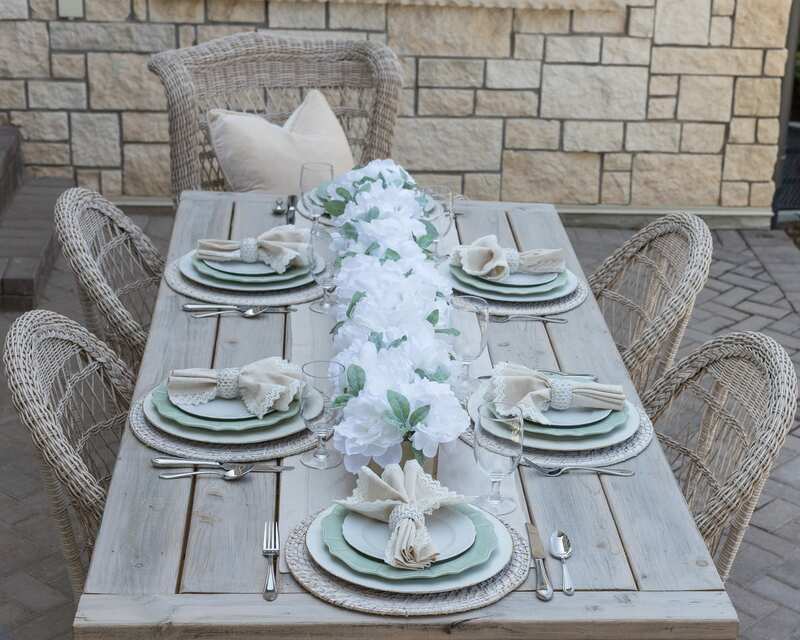 On the outdoor table I reversed the plates using the sage green dinner plate on the bottom and the white salad plate on the top, a white antiqued charger and a white washed wicker place mat. 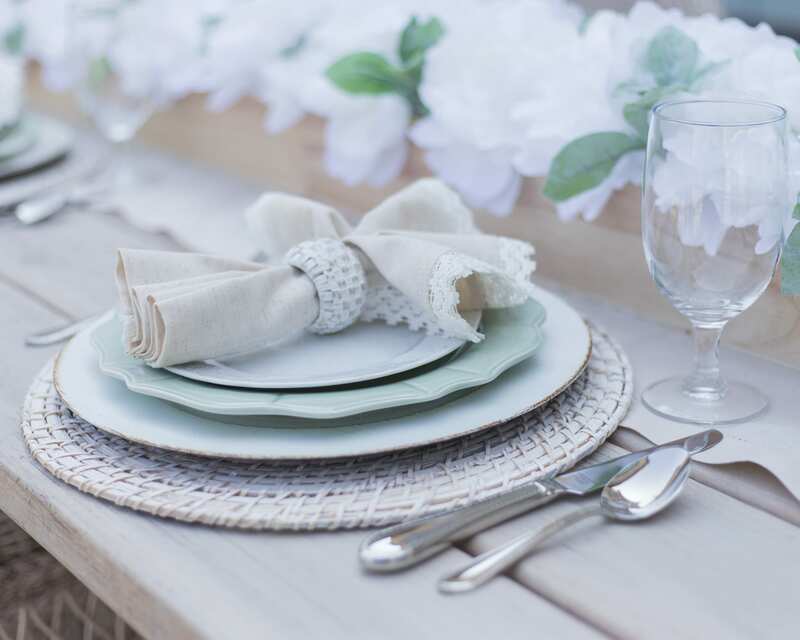 I used solid tan linen napkins with a lace edge to bring in some some softer elements. The napkin rings were were white antiqued wicker. Both tables I used simple stemware and silver flatware. For the indoor table, I used a tan linen table runner to build the table swag on. I always start with a base faux garland and build on top of that. I then added in faux greenery that had similar leaves and color and some small white flowers. Then I added in some lighter green leafed picks to add height and width to the swag. The last thing I added was a mix of white stem flowers. I used a variety of faux peonies, roses, and other white floral flowers. I added silver candlesticks at varying heights, and nestled some small silver mercury glass votive candle holders into the swag. I also used my antique salt and pepper shakers that were from each of my husbands grandmas. They both had the exact same salt and pepper shakers and somehow I was lucky enough to get them both! I like to use corresponding pillows in my end chairs. The indoor table is from Restoration Hardware and I’ve linked some similar ones a handful of of other items I used at the bottom of the post. I buy my faux flowers from wherever I can find them. Hobby Lobby, Michaels, HomeGoods, Pier 1, Pottery Barn, Crate and Barrel, and a local store in Utah called GatehouseNo1. I keep a stash of flowers in a closet and I reuse them over and over again to make my tablescapes and arrangements. For the outdoor table centerpiece, I used two premade boxes of white and green flowers that I found at HomeGoods. I kept this tablescape more simple for the kids. 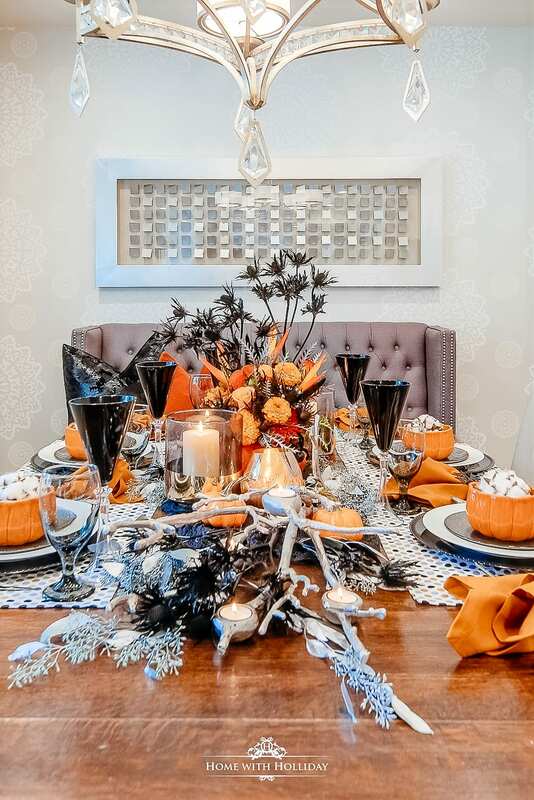 Creating a tablescape is a fun way to create a welcoming and warm feeling in your home. I enjoy the process of creating something that is beautiful. The best part is when I can use things I already have. 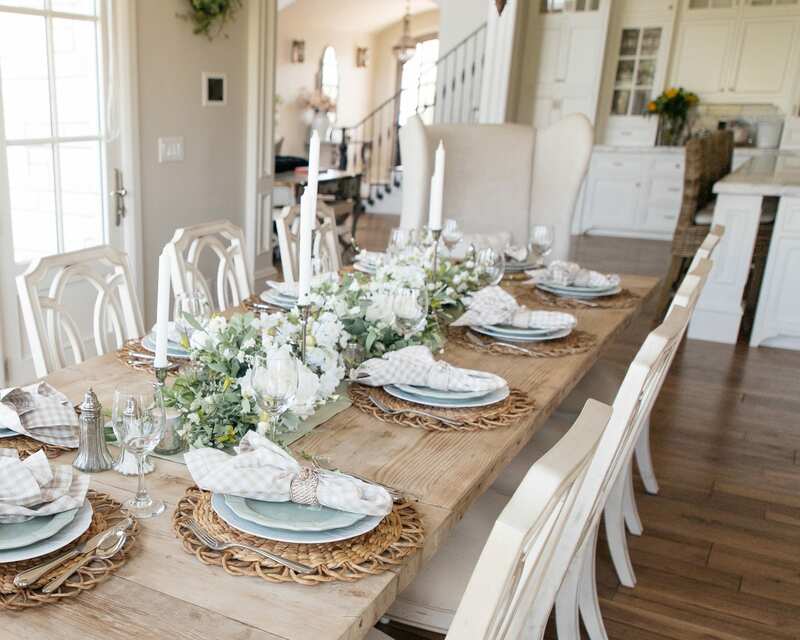 Look around your home and see what pretty things you have that can be used to create a beautiful tablescape. Sometimes mine are more elaborate and sometimes they are more simple. I love being able to use fresh flowers, but I also like being able to mix it up with faux flowers and greenery! I hope this helps inspire you to create something that fits with your style and taste. I reuse the same flowers, greenery and flowers for my tablescapes. I keep floral containers in a closet and store all of them in like colors. When I want to do a tablescape or create a faux arrangement, I pull from the things I already have. It’s an investment up front for nice faux flowers but if you take care of them and store them in floral containers, they can be used time and time again. Mix up your dishes or mix and match different sized plates if you have more people than you have one full set of dishes. What a gorgeous setting, Holly! Love it all and it looks so pretty in front of those beautiful doors! Thank you Summer! This was a fun one to do! 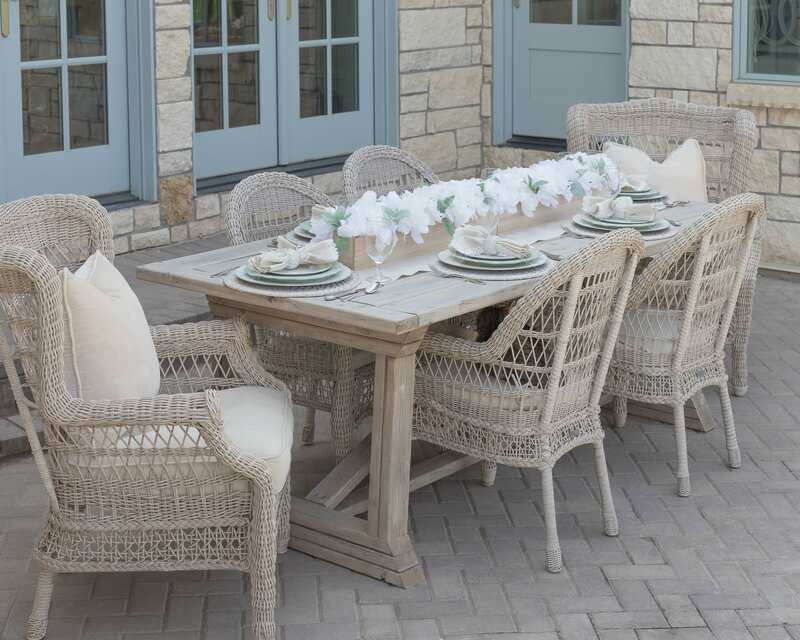 I loved having an indoor and outdoor one, each a little different but similar!! Where did you find your dining table? We are looking for one similar to yours and haven’t managed to find one yet! I have it linked in the bottom of the post. If you scroll down, you’ll see where I have linked the items I used in the photo. You can also click on shop my home or kitchen in the menu and it is listed there too. You can also follow me in the like to know it app and I have things linked thru their site too.